Rulersmith, Inc. has been manufacturing high-quality, extremely accurate quilting rulers since 1985. We are the original producers of the Omnigrid ruler which set the industry standard for quilting rulers and we are still making them today. We work with some of the top quilters in the world to develop high quality rulers. 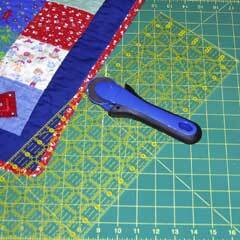 Our staff consists of very knowledgable quilters and designers that can help you with the design of your ruler or template. If you have a design already or need to start from scratch we will work with you to make sure that the end product is something eye-catching yet useful. It starts with your idea or design. We then give it to our designers who will go over it and make sure that it is feasible. After that process we laser-cut the product which will give it a nice professional polished edge. Next the design is screen printed very accurately on to the acrylic. Once the printing is done it goes to our Quality Control team to be checked for mistakes and then packaged for shipping.